A true statement piece, this handcrafted fixture combines a reclaimed barnwood beam with iron accents. The close up pictures show the amazing patina of this beam and heavy Iron work. 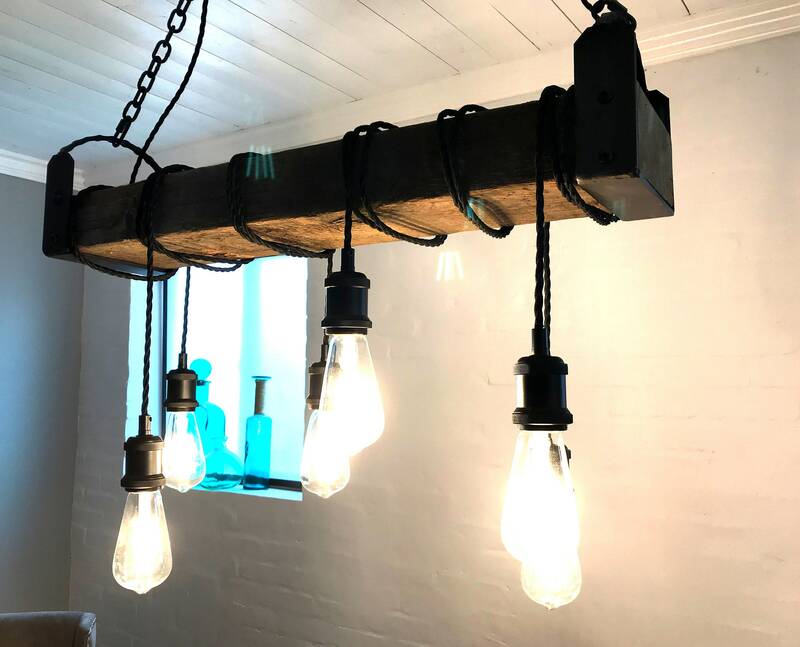 Fixture fashioned from 4"x"6" beam with 6 lights hang from the beam via wrapped black twisted cloth cord. Low wattage, long-life Edison style LED bulbs are included (shown in picture). Fixture measures 36" long. Lights hang down at various lengths. Black metal Sockets are suspended with vintage style twisted and cloth covered wire. All electrical components are new. Includes black steel canopy and all mounting hardware. Includes 6 LED antique style bulbs! Also included is a custom black steel canopy and hanging chain. Beam hangs down approx. 18" from ceiling (can be adjusted). For Commercial applications please message before purchase.